I'm not a huge fan of the winter or cold weather. Which is unfortunate, given that I live in Chicago. Just this week the weather really turned and we seem to be officially in Fall. The weather isn't so bad yet, but I'm mourning the long winter ahead... but these pretty flowers spotted at Pike's Place Market this summer are helping to cheer me up for now! The market was filled with gorgeous goodies of all kinds, but the flower vendors had me mesmerized by their buckets and buckets of gorgeous blooms. Peonies just always seem so happy and luxurious to me... all those fabulous fluffy petals! 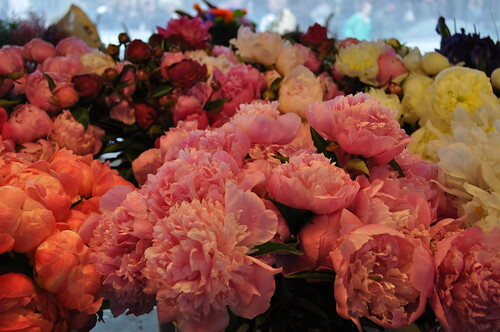 Those flowers are completely gorgeous -- it's such a delight to see peonies in the fall! I love Pike's Place market. There are so many things to explore that it's easy to get lost for hours! I LOVE peonies, can't get enuv of them. Btw, I'm a fellow BYW - nice to meet you - and loving your blog!